Our galaxy is full of undiscovered beauty obscured from our watchful telescopes by the thick expanses of dust and gas that that define the galactic disk our sun rests in. Nowhere is this more apparent than the center of our galaxy in the Central Molecular Zone (CMZ) which houses the galaxy’s most active star forming region as well as Sgr A*, our galaxy’s supermassive black hole. The area has been observed many times before in the infrared, but it took the high-resolution sub-millimeter images of the European Space Agency’s Hershel Space Telescope to identify a shocking new feature. When Molinari et al. reduced the data taken by Herschel as part of the Hi-GAL Key-Project, they noticed an inner ring of dense cold gas mixed with dust where new stars are forming. From our vantage point, the ring looks very much like an infinity symbol due to the torque the ring exhibits in its middle. 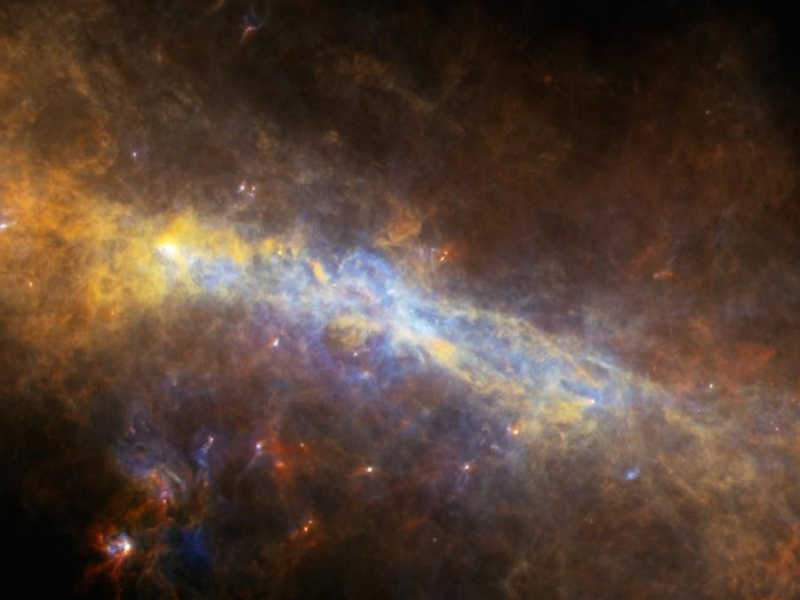 Our galaxy is not the only one to have a ring of dense gas at its center. 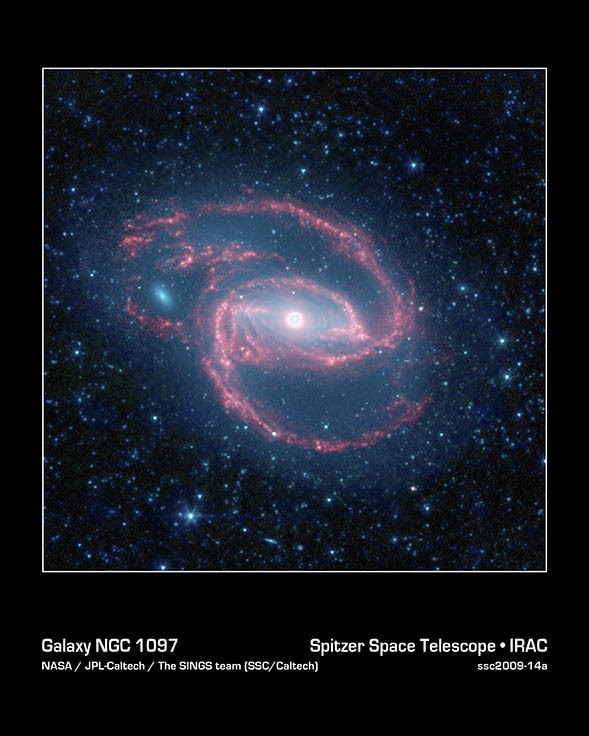 Other galaxy images by NASA’s Spitzer Space Telescope have shown rings of this nature. Using various techniques and models, the authors were able to make estimates of the dust temperature and hydrogen column density. They also estimate the ring mass to be by integrating the N(H) map within a contour surrounding the ring. The presence of foreground and background gas is subtracted out by assuming an average column density which they choose as the mean N(H) value in the interior of the ring feature. Armed with this knowledge, the authors built a simple toy model for the ring which they estimate to be 100-pc in diameter. Using averaged velocities from the CS survey by Tsuboi et al. (1999), they fit an ellipse with axis: a = 100pc and b = 60pc with a constant orbit velocity of 80 km/s. The ring is likely part of the ‘x2’ orbit system which precesses at the same rate as the solid-body angular velocity of our Milky Way’s Bar (which also happens to be delicious). The authors note that the ring may represent some remnant of a more dusty torus in existence when/if our galaxy was more active in the past. 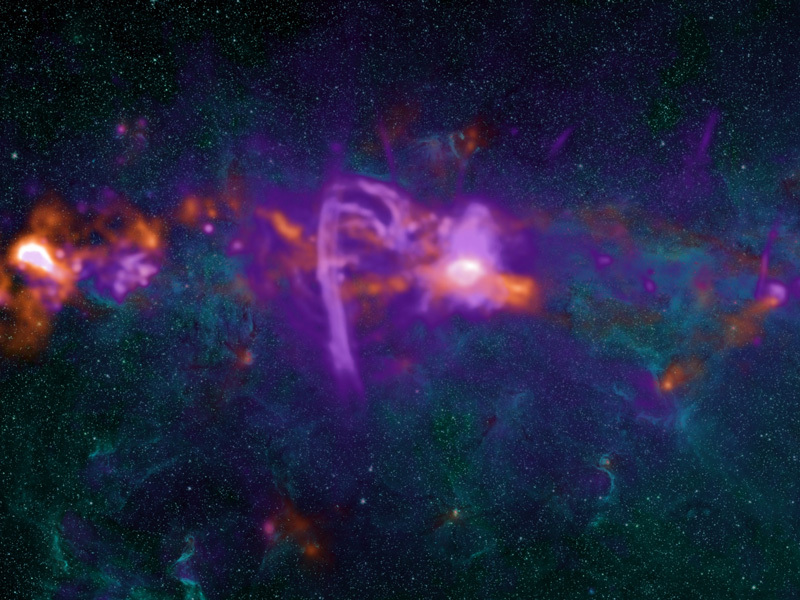 Other observations of X-ray and Gamma-ray bubbles rising from our Galactic Center work to support these theories, but it is impossible to speculate any further without more evidence. One interesting feature of the ring is its relation to Sgr A* which is displaced from the center of the structure by about 24 pc down our line of sight. This displacement my mean the ring is moving toward us in a ‘sloshing’ motion in response to the gas in the Galactic bar potential in addition to interactions with Sgr A*. This ‘ring of bright water’ has been described almost like a mobius strip. It has detached itself from the edge and twisted at the center. Does that not look from above like the Taijitu?